My recycled cashmere/cotton hourglass is all done! Details: After first trying to invent a new size between two sizes, I stuck with the pattern numbers and it came out fitting great. There's enough ease, but it's still nice and form-fitting. I also kept the body and sleeve length as given in the pattern and they worked out too (whew - I was worried about those sleeves!). I did however add two extra decrease rows to the top, to trim down the wide boatneck and give myself some bra strap coverage. And just for symmetry, I did two stitches between each of the raglan decreases, instead of just one. And finally, I wanted none of that sewing live stitches to the inside to form the neck hem and just bound off and whipstitched it closed. Sometimes, you just gotta go with what you know. So with this motto in mind, I must say that I really didn't have any problems with the pattern at all. Conclusion: I love, love, love it! I had no idea it would fit so well. And the yarn was also a real surprise. It was a 65/35 cashmere/cotton blend that I recycled from an at least 10 year old Banana Republic sweater. It suffered a bit in the ripping (although I carefully ripped the entire sweater by hand instead of using the ball winder), making the yarn a little less tightly plied. 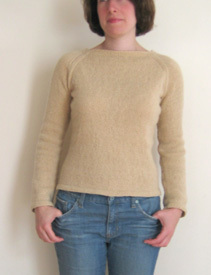 But the slight uneveness gave the sweater a natural and casual sort of look, which I really like. In a way it reminds me of the cash iroha that the pattern called for, which is often irregularly dyed and sometimes slubby. 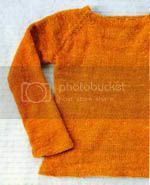 It makes the sweater lovely and feminine without seeming too dressy and delicate. It's definitely a keeper! It's been great knitting along with everyone! Lovely colour, great fit, brill! Looks great, what a great idea to recycle an older sweater! BRAVO! I often hear of knitters winding up an old sweater or a thrift store find, but I rarely hear about the new product that comes out of it! I'm thinking of steeking mine as the wool is too warm for me.